Description: 2nd section of Amtrak P920 bound for the Rockingham Raceway from Raleigh/Cary. Description: The American Association of Private Railroad Car Owners held their 26th Annual Convention at New Orleans Union Passenger Terminal on 2-4 October 2003; and the organization ran a special train from Chicago to New Orleans, with most of the route over the Kansas City Southern! Here is the 19-car special descending the Mississippi River bridge at Baton Rouge behind Amtrak P42’s 144 and 97. Description: 4 locomotives, headed up by 115, power #4, the SW Chief towards Chicago. Description: Running about 15 minutes late, the westbound Empire Builder (# 7) arrives at the Winona depot with three Sounder Commuter cars in tow. 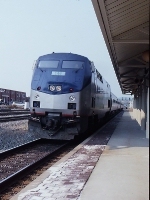 Description: The eastbound Pennsylvanian prepares to stop at the platform in Altoona. Description: Amtrak, Second unit on the American Orient Express. Description: Amtrak, motive power for the American Orient Express. Description: American Orient Express takes on supplies at the Idaho Falls, Union Pacific Passenger Depot. Description: Winter is coming as this iclcle hangs down as Amtrak 5 passes by with 144 which is nicknamed the Cow Terd Unit because it hit a Cow Poop Truck in Montana in 2003. Description: The Eastbound Empire Builder headed to Chicago with the private car "Montana" on the rear. Description: Months later, i forgot what train this was, but in typical Amtrak fashion, it was 3 hours behind schedule. Description: So we went camping at Winter Park and on the way to the campsite we made a right on a side road. I saw a head of us that the crossing gates were down and I thought "cool i'll get to see some UP!" Well we got up to the gate, i looked to my right and I saw Amtrak! That was awesome!!!!!! Description: Going over the crossing, dont worry the gates went up! Description: genesis 144 slows to a stop in ashland with regional train number 195 from boston to richmond, va. Description: Silver Star's "guest star" is headed back to Raleigh, once again following the US 17-92 corridor thru Central FL. 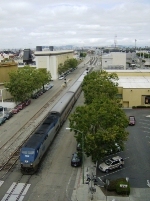 Passing north end of Rand Yard.